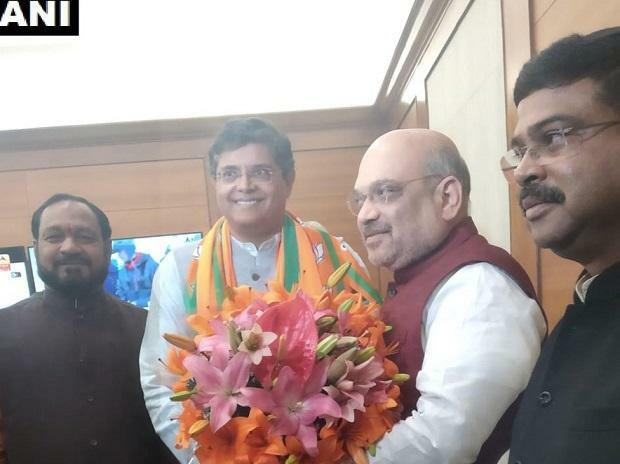 Former BJD lawmaker Baijyant 'Jay' Panda joined the Bharatiya Janata Party (BJP) Monday, giving a boost to the party in Odisha where it is looking to improve its tally in the upcoming Lok Sabha elections. The Assembly poll in the state is likely to be held along with the parliamentary elections, and the party hopes that the presence of Panda will brighten its prospects, especially in coastal Odisha. Panda met BJP chief Amit Shah and joined the party at its office in the national capital. Panda, who owns an influential media empire in the state, had been a leading parliamentarian of Odisha Chief Minister Naveen Patnaik-led Biju Janata Dal before he fell out with its leadership. Amid his perceived proximity with the BJP, the BJD suspended him last year for "anti-party" activities. He then resigned from the BJD and also the Lok Sabha, where he represented Kendrapara constituency twice. He has also represented the state in the Rajya Sabha. The BJD had accused him of "anti-party activities" to justify his suspension. It later alleged that he was involved in money laundering as it sought a probe. Panda had denied the charge. Odisha has 21 parliamentary constituencies and the BJD had won 20 of them in 2014. The BJP had won only one seat -- Sundargarh, represented by Union minister for tribal affairs Jual Oram. The BJP has identified Odisha as one of the priority states ahead of the polls. In the 2017 state rural elections, the BJP emerged as the second largest party, pushing the Congress to the third spot.